Born in 1909, Dr, O. B. L. Kapoor had strong leanings towards the Advaitic philosophy of Sankara. 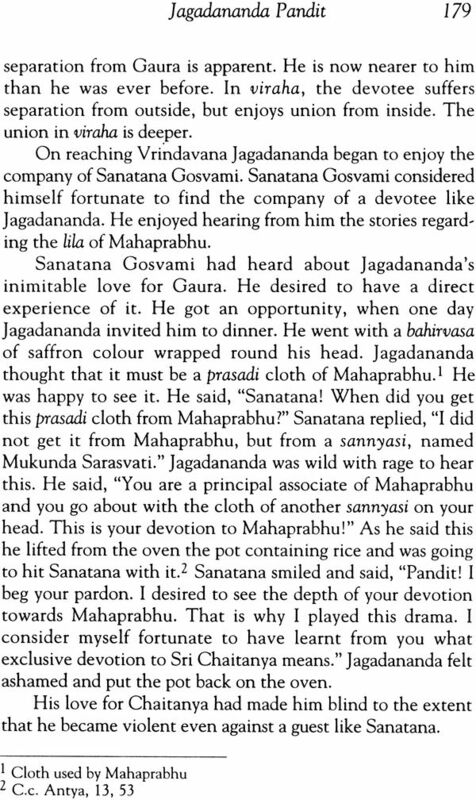 In August 1931, when he was working as a research scholar in the University of Allahabad, he met his guru Sri Srimad Bhaktisiddhanta Sarasvati Gosvami Prabhupada, who pulled him out of his Advaitic moorings and intiated him into Bhakti. On his advice and under his close supervision he wrote a thesis on the Philosophy of Sri Caitanya. The thesis was approved by the Allahabad University for the degree of Doctor of Philosophy. Dr. Kapoor has the unique distinction of being the first Doctor of Philosophy of this prestigious University. He worked as Research fellow at the Indian Institute of Philosophy, D. Litt. Scholar, University of Allahabad, and Professor and Head of the Department of Philosophy, B. R. College, Agra till 1951, after which he joined U. P. Educational Service Class I and worked as Professor and Head of the Department of Philosophy at the K. N. Govt. College, Gyanpur (Varanasi) and Principal, Govt. College, Gyanpur/Rampur till his retirement in 1967. 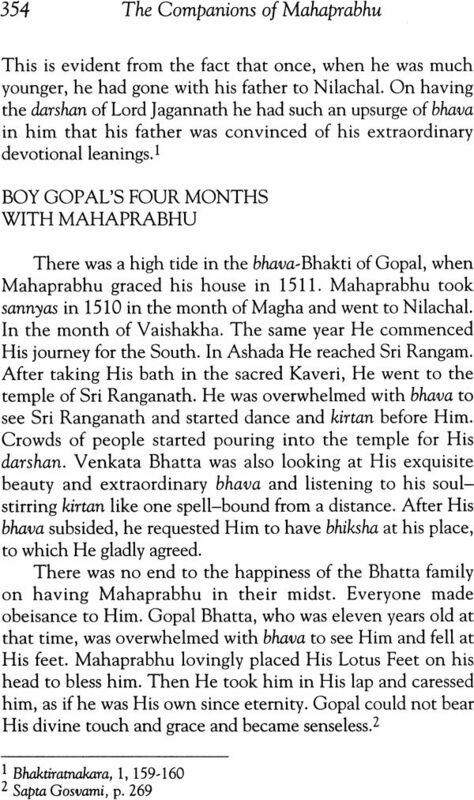 Since 1967 he has been living in Vrndavana and writing books and articles in Hindi and English on topic relating to Bhakti. He has written more than 30 books and a large number of articles, published in different journals. His writing have been widely appreciated. 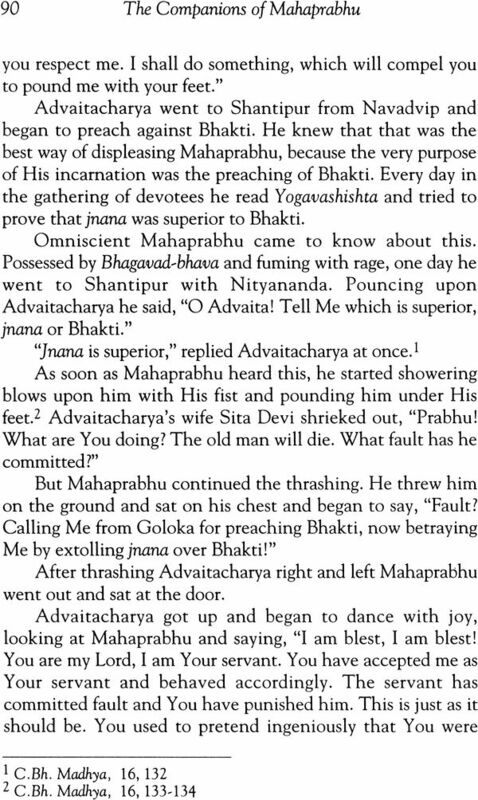 The material for the biographies of the companions of Sri Chaitanya is scanty. 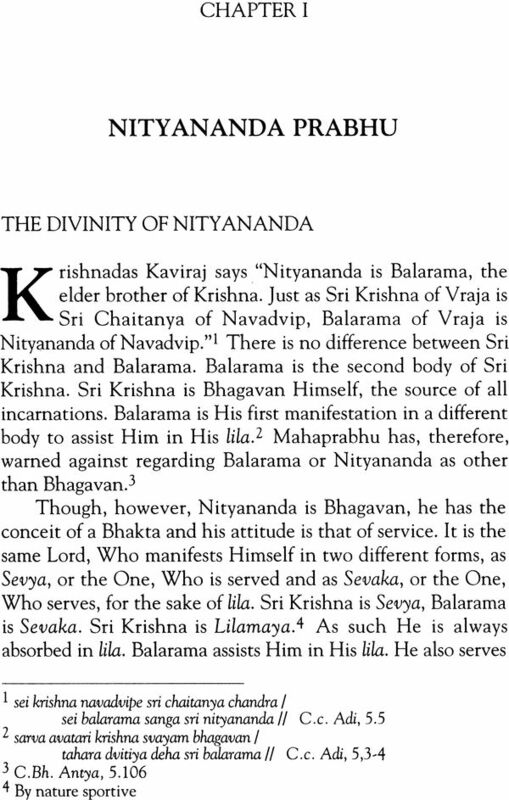 No independent biographies of any sort exist on them, except for Nityananda-charita, the biography of Nityananda Prabhu, written by Vrindavan Das and Advaita Prakash of Isana Nagara, of which the authenticity is regarded as doubtful. 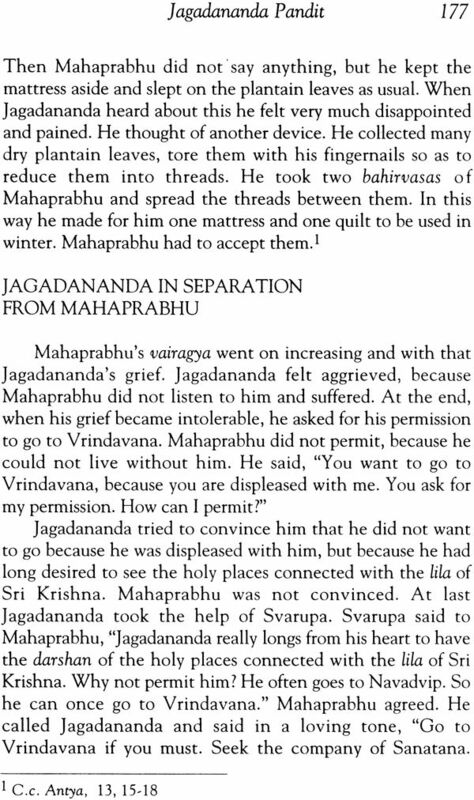 But the companions of Sri Chaitanya are completely surrendered to Sri Chaitanya. They know nothing except him, and do nothing except pleases him. They are his arms, through which he works to fulfill his aims and purposes. 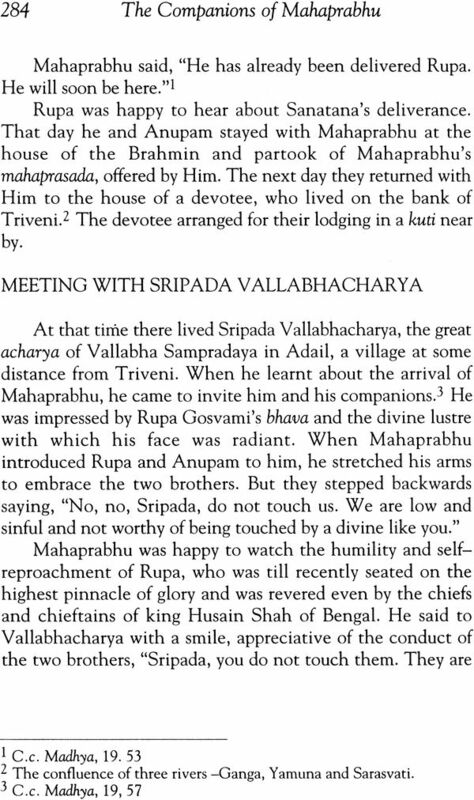 Their biographies to a great extent are virtually part and parcel to the biography of Sri Chaitanya. The sources from which material for their biographies can be drawn are to a large extent the same as the sources form which the material for the biography of Sri Chaitanya is drawn. 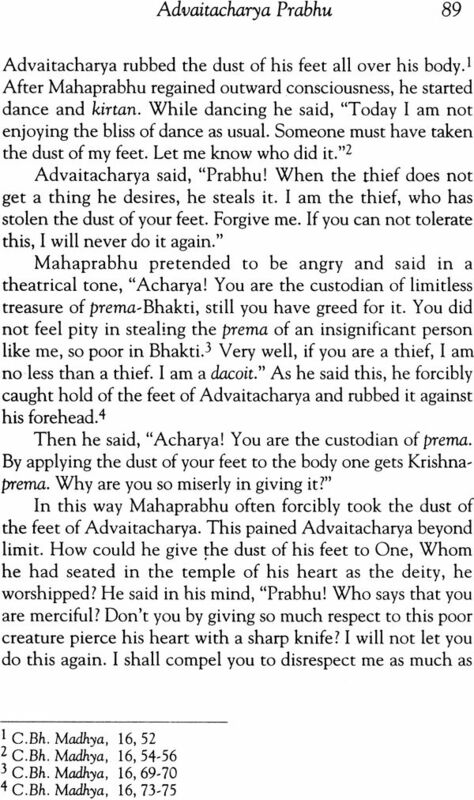 They are, principally, Chaitnaya-bhagavata, by Vindavana Das, Chaitanya-charitamrita, by Krishnadas Kaviraj, Sri Krishna-chaitanya-charitamrita or the Kadacha by Murari Gupta and Sri Chaitanaya-charitamrita-mahakavya by Kavikarnapura. 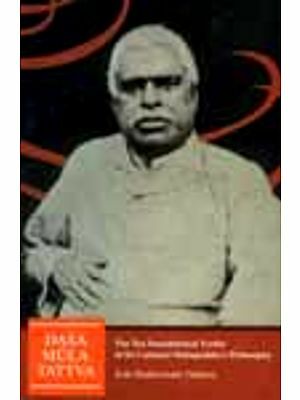 These have, therefore, been adopted as the main sources for the biographies included in this book. On account of dearth of any other material these biographies have to be short, some of them so short that it would be ridiculous to call them biographies. They are at best notes. 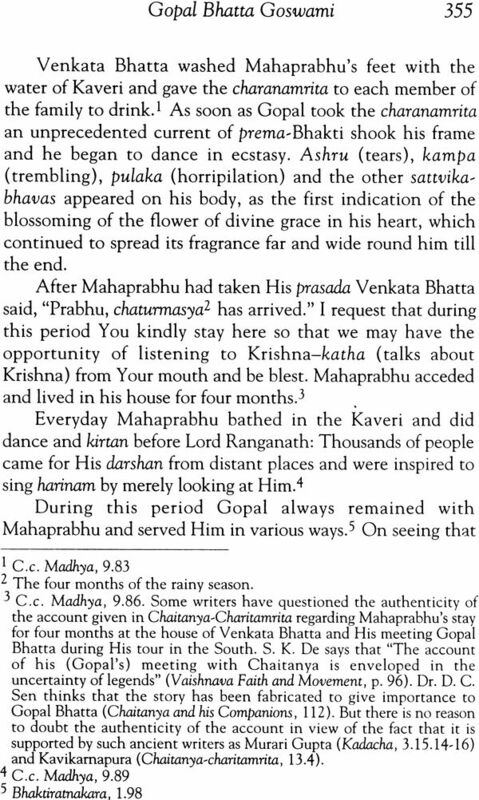 But they are important in as much as they reveal some important traits in the character of some devotees or some episodes in the life of Sri Chaitanya, which relates to them. 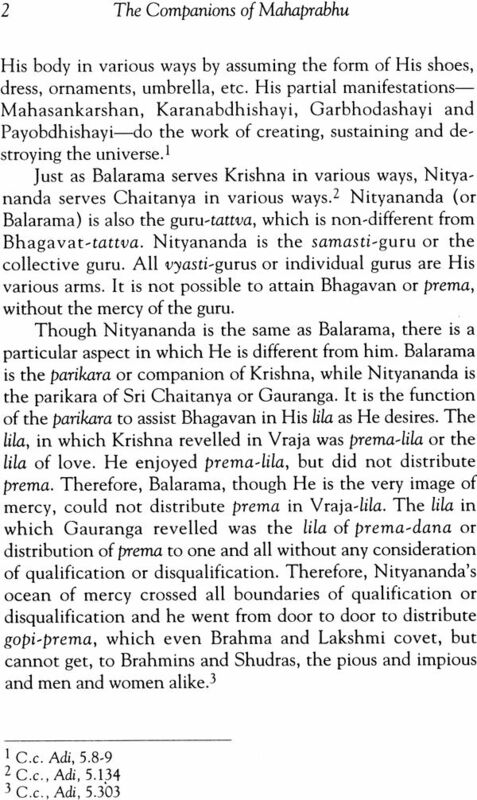 One difficulty, which the author had to face in writing these biographies, relates to the pronouns used for Sri Chaitanya. According to the usage in English language the pronoun used for God has to begin with a capital latter. 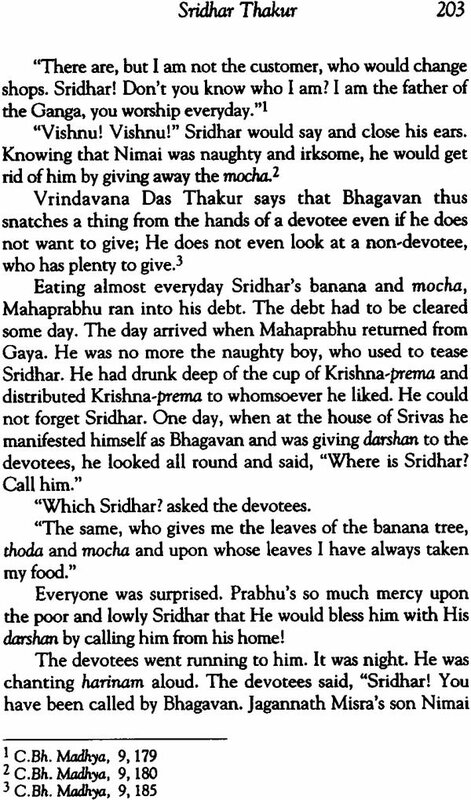 Sri Chaitanya is God or ‘Bhagavan’ incarnated as ‘Bhakta’ or a devotee, but he sometime manifests Himself as Bhagavan. 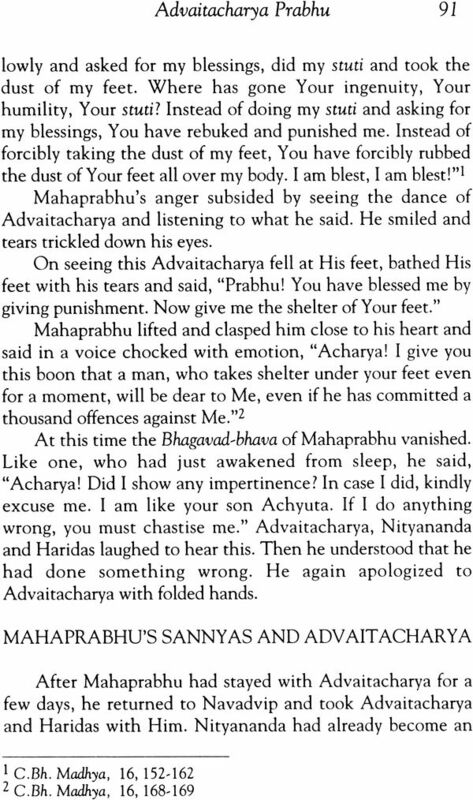 The author has used capitals for him only when be ridiculous to use capitals, when he behaves as Bhakta as, for instance, when he touches the feet of Vaishnavas and asks for their blessings, There are, however, occasions when it is difficult to know whether he behaves like Bhakta or Bhagavan. In such cases the author has used his discretion in regard to the use of capitals. 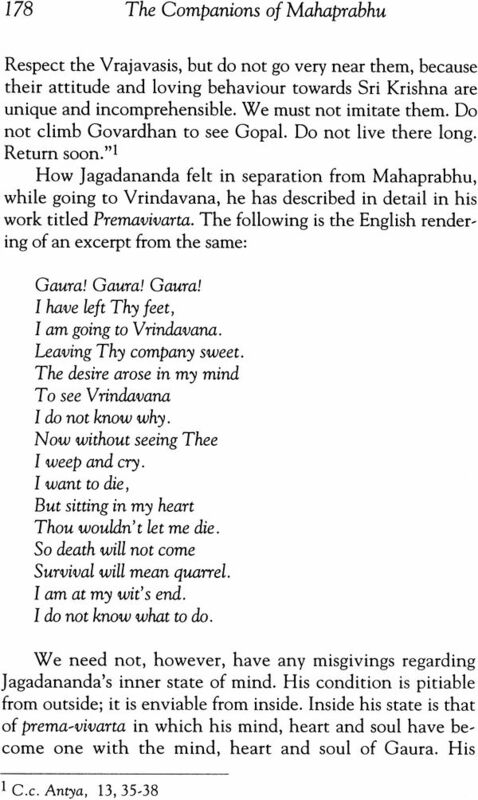 Another difficulty, which the author had to face was in regard to the English equivalents of certain Sanskrit words. 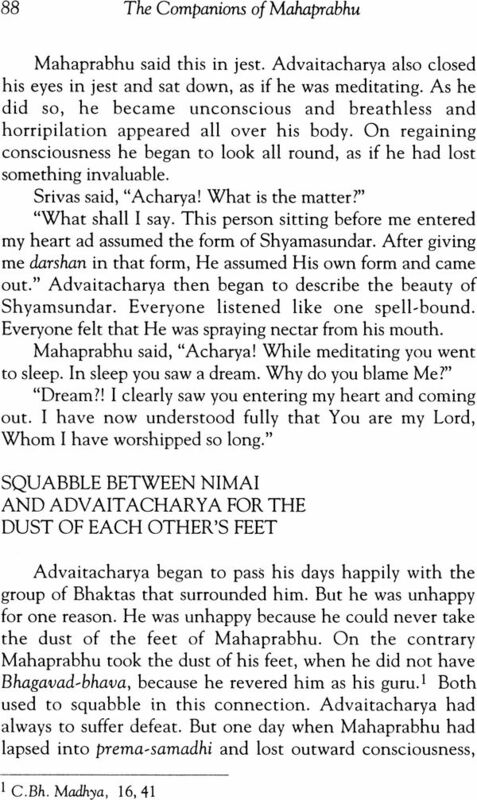 For instance, ‘bhava’ is translated into English as ‘emotions,’ but in Sanskrit it means, besides ordinary emotion, trans-psychological emotion, which relates to Bhagavan and is, instead of being the result of the phenomenal framework, the effect or manifestation of the Internal Potency (Svarupa-shakti) of Bhagavan. 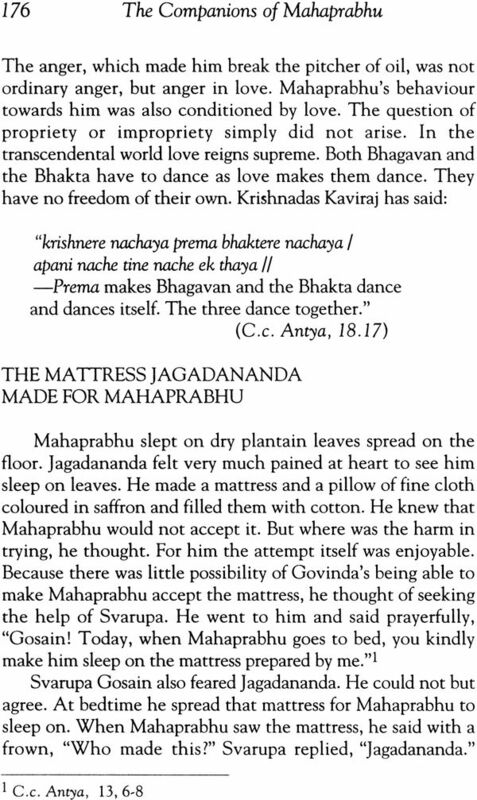 It is in the latter sense that the term is mostly used in Bhakti-literature. 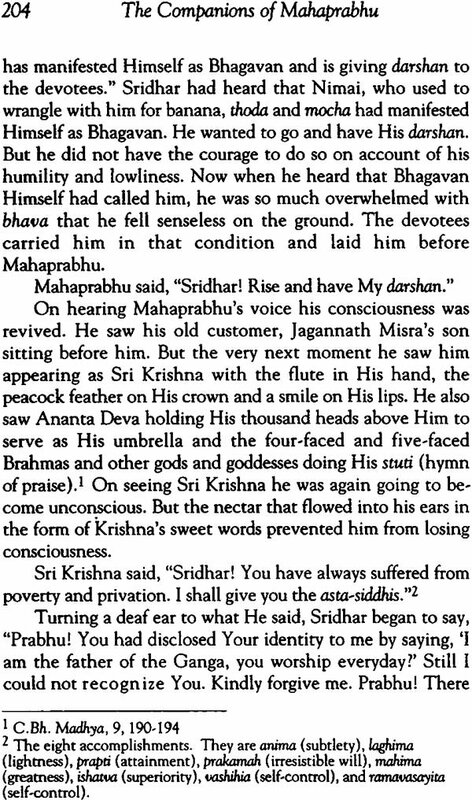 Similarly the word ‘darshan’ is translated as ‘seeing,’ but ‘darshan’ in Sanskrit is seeing with reverence and is generally used for seeing the deity or the holy persons and places. 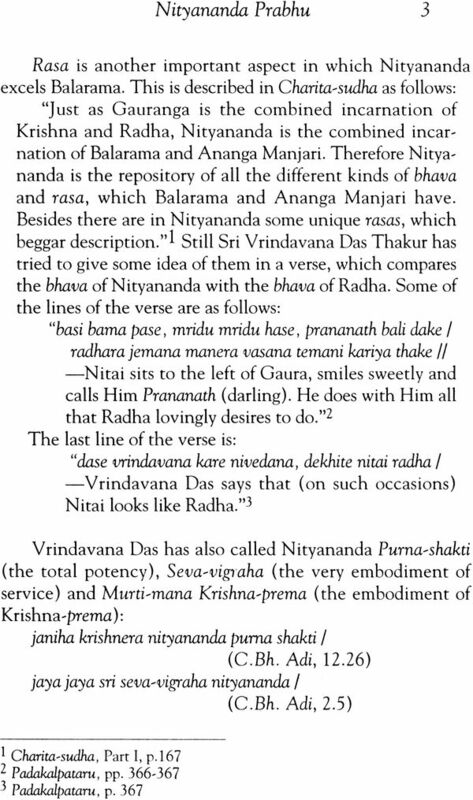 The author has, therefore, considered it proper sometimes to use the Sanskrit word itself rather than its English equivalent. The author is grateful to Smt. 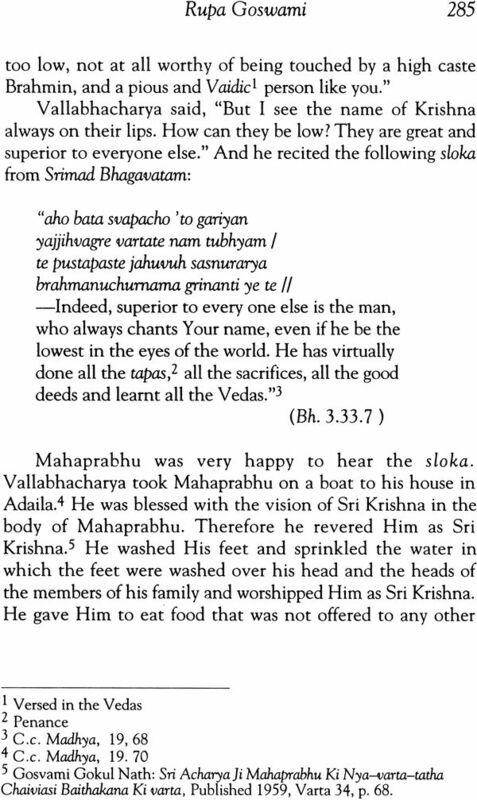 Gaura Purnima Devi for kindly typing the work on the computer and to his friend Sri Radharaman Sadhu for helping in composition and printing.